This tapered boiler is obviously new and unfired but there is no history or certification available. It is numbered 416 on the firebox backplate. Apologies for the error. Barrel length: 270mm. Grate for Live steam... Condition is Used. 2.5mm gap between bars. 67mm wide. 220mm long. 11mm side depth. Stainless steel. Dual gauge 5" and 7 1/4" track gauge, set of 3. Laser cut from 6mm steel. A nice double bogied truck, very well made and in all round good condition. This is a robust well made truck ready for use. It has a small knick in the cover near to the front end (see photo), every where else is good. Hornby Stephenson's Rocket live steam train set. 3.5" gauge, plus track and box. Unfired in good condition.Dispatched with Royal Mail 2nd Class. Looks to be in good order and includes all fittings. This item has not been tested. Rob Roy 3 1/2" Dome - machined and polished from casting. Internal bore is 20mm diameter to fit over inner dome. PLEASE NOTE; Finished Rob Roy is for reference only and is not part of the sale. Radius Rods & Eccentric Rods for 5 inch gauge Simplex Locomotive, Live steam. Bought with a kit of parts for a Super Simplex but not used, as they are for a Simplex loco not a Super Simplex. Condition is new, see photos. Looks to be in good order and includes fittings and oiler. Condition is Used. This is based on a Class 73 Design in Pullman colours it has a Sinclair C5 motor which runs on 12v. It's a good little runner and shifts like stink. It can also run by it's self if you don't want ride behind it. Recently had new paint job and service, in excellent condition. Hydraulic 8/5/22 Steam 8/5/19. Motion Brackets for 5 inch gauge Simplex Locomotive, Live steam. Slide Valves for 5 inch gauge Simplex Locomotive, Live steam. Condition is new, see photos. Mamod Steam SA1. THERE IS NO BURNING TRAY. LOOKS TO HAVE BEEN HARDLY USED. 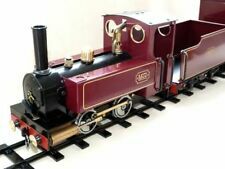 Stephensons Rocket and Tender ~ Made in England by Hornby Hobbies Ltd. Here we have the Hornby Railways G100 Live Steam Train Set. It would benefit from a light clean/airbrush. (Rocket approx. Tender approx. ). FOR SALE ONE G100 STEPHENSON'S ROCKET in very near mint the canister is within a sealed bag and the pipe needs attaching to the tender slight paint rub to tender underside of the canister cover. A 4-6-0 GREAT WESTERN RAILWAY COUNTY "1000" CLASS TENDER LOCOMOTIVE. I have noted that the Tender is fitted with a Hand Operation Boiler Feed Water Pump, Leaf Springs and Tender Brake. The Locomotive has a Copper Silver Soldered Boiler, Steam Pressure Gauge, Fire Box Door, Forward & Reverse Motion Selector, Twin Outside Cylinders, a Fitted Steam Brake Cylinder (regulator not connected) and Twin Water Injectors. LARGE 3/4 (9") SCALE TASKER 'LITTLE GIANT' TRACTION ENGINE LIVE STEAM - 'READY TO RALLY!'. 14 MTH STEAM TEST. 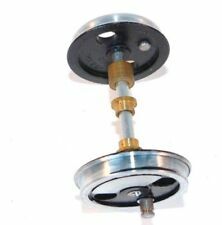 CRANK DRIVEN WATER PUMP. SINGLE CRANK MOTION. STEAM INJECTOR. STEAM WATER LIFTER. 10YR HYDRAULIC TEST. Full Size Traction Engine Locomotive Vintage Lamps Lights SET. These are believed to be original Fowler traction engine lamps. They appear to have been repainted at some point to a high standard and they really look the part! Measures: Height: 15 inches. Width: 6 3/4 inches by 7 inches. Diameter of front lens: 5 1/2 inches. 9 by 6in apprx, 199pp, first edition 1950, very detailed book on Live Steam model railway locomotives. covers everything with great detailed plans, photos and sketches. Very interesting detailed good quality book. Superb book. An introduction to model locomotive building for virtually every enthusiast who possesses, or hopes to possess a lathe and has the urge to construct his own model steam locomotive. It is the 1972 Edition published by Model & Allied Publications. The tender is in need of finishing. It needs buffers, draw bar and tubes to connect to the locomotive. All driving wheels are sprung. Cab is brass. Size is 80 Long x 18 wide x 27cm High - Locomotive only.